Grave marker for Michael J. Migliaccio in the Lakeview Memorial Park, Cinnaminson (Burlington county), New Jersey. Born in Italy, Michael immigrated to the U.S. with his parents when his was just two or three years old. 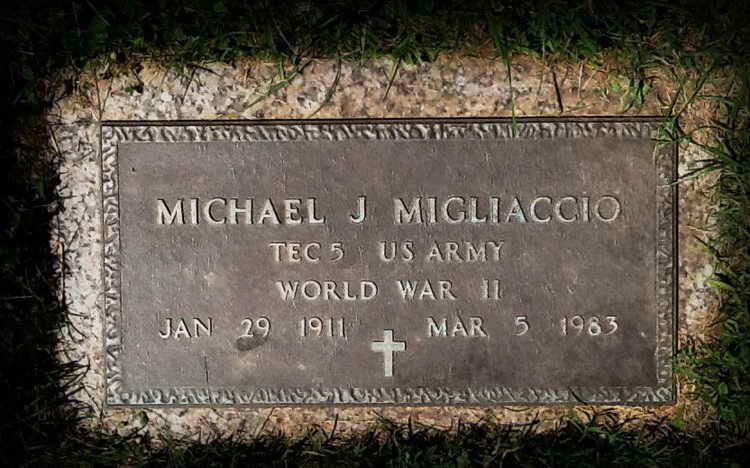 Michael enlisted in the Army at Camden, NJ on 14 September 1942 and was a member of Service Company, 508th PIR. He was awarded the Combat Infantryman badge for action during the Ardennes campaign, 18 Dec 1944 to 20 Feb 1945.